William Mullin, hosting some great downtown comics! 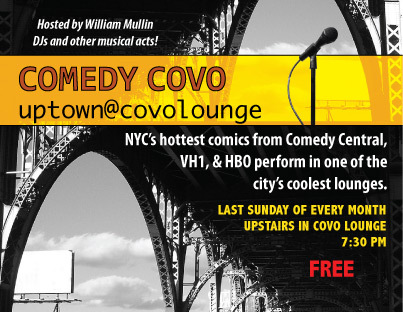 Comedy Covo enters its third year as the longest running free comedy show in Harlem. We have another awesome comedy night at Covo Lounge this Sunday, Mar 24th at 7:30pm. Monthly comedy show with some of NYC’s hottest comedians in one of NYC’s coolest lounge. Hosted by NYC comedian William Mullin featuring comics from Comedy Central, VH1, and HBO. and DJ THE LEGENDARY CHRIS WASHINGTON spinning some awesome tunes! 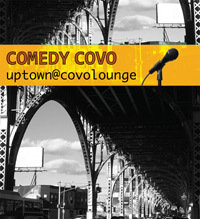 Join us upstairs in Covo Lounge for great laughs, drink specials and half price panini! AT COVO LOUNGE, 138th at 12th Avenue. Click here for directions.